방송인 김나영이 한국을 넘어 홍콩에서도 매력을 인정받았다. 김나영은 최근 자신의 SNS를 통해 “홍콩 친구가 보내준 사진. 홍콩 Ketchup magazine. 춘천에서 올라와서 홍콩잡지의 커버걸이 되다니. 단단히 출세했다”며 홍콩 잡지의 커버걸이 된 소식을 알렸다. 사진 속 김나영은 탈색한 금발머리와 늘씬한 각선미를 자랑했다. 이어 인터넷 커뮤니티에는 ‘김나영 홍콩 잡지 커버장식’이라는 제목의 게시글이 등장했다. 사진을 접한 네티즌들은 “옷태가 좋다. 김나영 옷입는 스타일 좋음” “김나영 홍콩 잡지 커버걸 장식이라니. 대단하다” “저번 패션위크 때 의상도 독특했는데 이번 의상도 멋있다 “김나영 홍콩 잡지 커버걸 장식 부럽다” “카페에서 마주친 적 있는데 일상의상도 센스가 넘치더라” 등의 뜨거운 반응을 보였다. An entertainer Kim Na Young got recognition of her charm in Hong Kong beyond Korea. "This is a picture which my friend sent to me from Hong Kong. 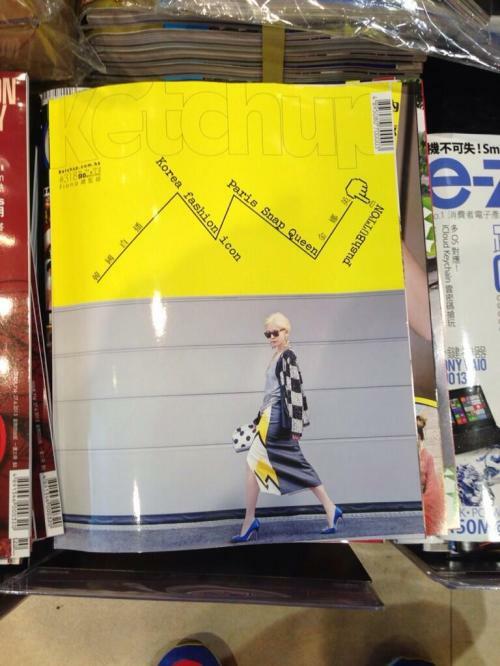 It’s the Ketchup magazine of the country. I came up to Seoul from Chuncheon and became a Cover Girl of a magazine. I got ahead in the world." she announced through her SNS lately. She showed off her blond hair bleached and skinny body in the picture. Following this, there’s an article titled ’Kim Na Young appeared a cover of Hong Kong magazine’ on an internet community. Netizens who saw the picture showed an enthusiastic response like "It looks good on her. ", "I like her style. ", "She became a Cover Girl of Hong Kong magazine. She’s awesome. ", "Her clothes was unique at the last fashion week. These clothes are also cool. ", "I envy her. ", "I came across her in a cafe. Her everyday wear was also sensible." etc.